Details on the bug and steps you can take to avoid it. 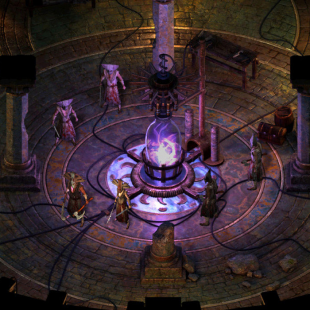 A game-breaking bug has reared its ugly head in the recently launched Pillars of Eternity, available for Linux, Windows, and Mac systems. The bug is triggered by double-clicking an item to equip it to your character, which in turn removes all passive, racial, and permanent buffs forever. The short answer to keeping all your buffs safe and sound would be to not double-click the item to equip, but instead drag and drop the item into a slot on the inventory screen. So what are you to do if you've encountered the bug? You can load up an old save of the game and head about your merry way, but without any of the progress made between the time of that save and the triggering of the bug. That's obviously not ideal, but an Obsidian developer has stated that they "have a fix for [the bug] and [are] trying to make it retroactive, so it will fix any save games that have this problem." If a member of your party has come in contact with the bug, you can remove them from the party and then add them back again, which seems to work as a solution. Meanwhile, there is some good news to revel in. According to Polygon, "others report that though passive buffs do not show up, they appear to still be present and working."